Join us on the third Sunday of each month between February and May for an immersive and family-friendly day of all things LAIKA Studios. 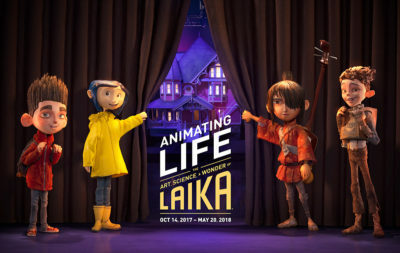 Each LAIKA Sunday will include opportunities to meet some of the incredible artists who make the magic happen behind the scenes, participate in a LAIKA-inspired family tour, get creative with some analog animation activities, and settle in to watch a LAIKA film or other classic animated work. Be inspired, have fun, and bring your own ideas to life! At the heart of every LAIKA film is a creative process that kindles the imagination. This hands-on activity guide explores key elements of that process, from developing characters and building their physical worlds to a crucial focus on storytelling. Join Mark Shapiro (LAIKA Marketing) for an introduction to the LAIKA exhibition. He will stick around to answer your questions in the exhibition. Pop in to make a simple optical illusion or “wonder tuner” toy using cardboard, string, and your own twirling hands. Veronica Hernandez, Senior Roto/Paint Artist. This panel discussion will highlight the work of LAIKA’s VFX (Visual Effects) team during the production of the studio’s first three films: Coraline, ParaNorman and The Boxtrolls. Using behind-the-scenes footage and images, the group will share stories from the productions and speak to the evolution of LAIKA’s visual effects workflows as the films become more ambitious and larger in scope. This second panel will showcase the Oscar-nominated Visual Effects (VFX) work done by LAIKA on their most recent film release: Kubo and the Two Strings. The group will share stories from the production and speak to how they overcame the many challenges presented by LAIKA’s most ambitious film to date. Every artwork tells a story. Join a Museum guide for an interactive exploration of the stories told by works in the PAM collection, and in Animating Life: The Art, Science, and Wonder of LAIKA. Stop by this informal meet-and-greet (and take photos) with puppets from Kubo and the Two Strings. *Film only tickets can be purchased at the NWFC website. Admission: Except where noted, all LAIKA Sunday programs free with Museum admission. The Museum and programs are always free for Members and for youth 17 and under. Tours, panel discussions, and film screening are first come, first served. Please note there may be limited capacity. Presented in conjunction with Animating Life: The Art, Science, and Wonder of LAIKA, on view October 14, 2017 through May 20, 2018.